Christopher Morris (left), scholarship recipient, La Salle University, with Jibu Vergis, president, TEI Philadelphia Chapter. A highlight of the Philadelphia and Harrisburg Chapters’ year is awarding scholarships to outstanding students from local universities. The two chapters pool their resources to maximize scholarship awards. 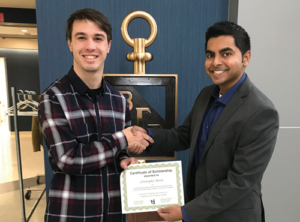 In the 2017–2018 year, they awarded six $2,000 scholarships. A scholarship candidate must be a junior or senior accounting or business major who is considering a career in the tax field. Candidates must maintain a 3.0 GPA and demonstrate significant accomplishments, such as being named to an accounting honor society or earning an academic award. This year’s scholarship winners were Michael Coppola, West Chester University; Courtney Murphy, Villanova University; Kathleen Wendling, Widener University; Christopher Morris, La Salle University; Tracey Vuong, Drexel University; Emily Ward, Philadelphia University; and Rachel Pardoe, St. Joseph’s University. 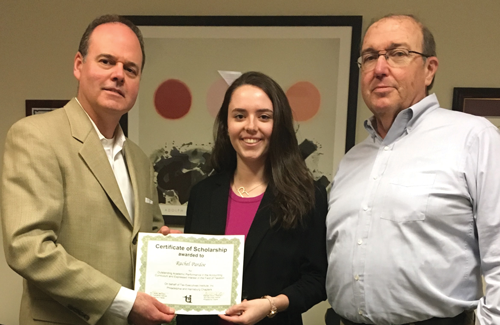 From left: Joseph Larkin, chair and associate professor of accounting, St. Joseph’s University; Rachel Pardoe, scholarship recipient, St. Joseph’s University; and Gordon Soda, TEI Philadelphia Chapter. All the recipients expressed their appreciation for the scholarship. Coppola and Morris each said the award would help further his career in tax. Coppola’s interest in the field was sparked by his West Chester University professor Kevin Flynn, whose Tax I class convinced Coppola that tax is enjoyable and challenging. He interned this past summer at Airgas in Radnor, Pennsylvania, a Philadelphia suburb, thanks to Philadelphia Chapter member Bonnie Baskin, who is senior manager of income tax at Airgas and a West Chester alumna. Morris revealed that accounting and tax are in his DNA. His dad was an international tax accountant for UPS and encouraged Morris’ interest in accounting and tax. Morris aims to become a partner at KPMG, where he started this fall. He hopes ultimately to become a subject-matter expert in a KPMG specialized group such as international tax. 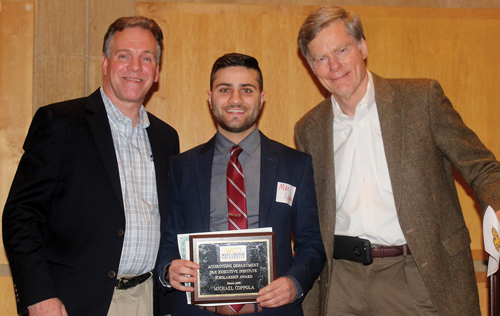 From left: Kevin Flynn, associate professor of accounting, West Chester University; Michael Coppola, scholarship recipient, West Chester University; and Evan Ernest, TEI Philadelphia Chapter. The Philadelphia/Harrisburg scholarship program is one of the most generous within TEI. Since 1998, the program has awarded nearly $225,000 to 113 recipients.